Today members of the Cornwall Archaeological Society will have received copies of the latest newsletter. I didn’t expect to be featured on the front page! Below is the text from the newsletter which I wrote after an intensive couple of days research in the Society of Antiquaries library. I have many more thoughts and notes on the matter and will write a follow-up post. In 1986 Ian Cooke first recorded, on the north-east side of the central stone at Boscawen-ûn stone circle, the presence of a pair of carvings interpreted as representations of neolithic stone axes. This remarkable discovery is relatively obscure and beyond the initial plans to record their location, and beyond Peter Herring’s excellent report in 2000, little research has been undertaken. In early July 2015 the author was kindly taken to Boscawen-ûn by Adrian Rodda and shown the carvings. During this visit the central stone was recorded using photogrammetry, a technique which uses photographs to create a highly detailed 3D surface model. Close analysis of the resulting 3D model of the central stone revealed the carvings clearly. The model was straightened so that they could be inspected more closely. Surface colour was removed and digital techniques were employed to accentuate any surface features. The results were surprising. 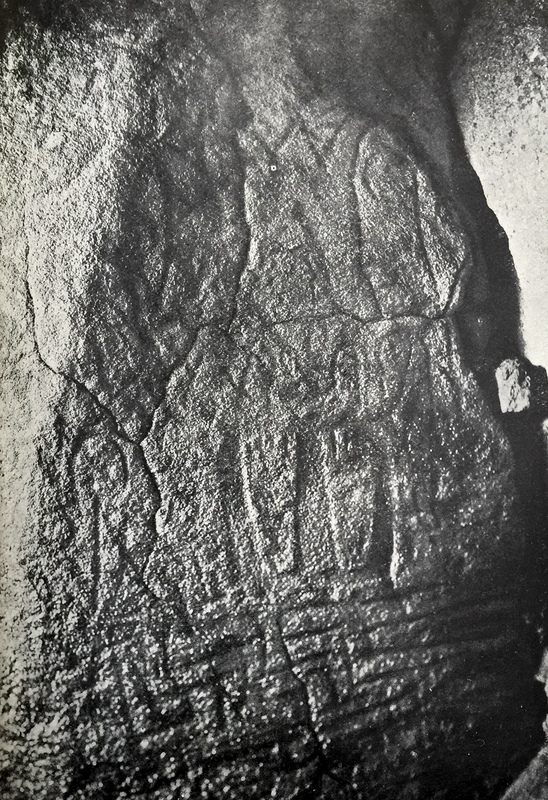 Depth image of the NE (inner leaning face) of the central stone. The carvings appear to represent not two stone axes but a pair of feet, soles outwards, carved in low relief. A row of ‘toes’ can be discerned, especially on the right-hand foot. Accessibility shaded image of the carvings. They bear a striking resemblance, albiet weathered and on coarse Lands End granite, to those recorded at Dolmen du Petit-Mont at Arzon in Brittany. Barbara Bender noted in 1986 that the stone bearing the feet motif had disappeared. Presumably it was removed or destroyed in WWII. However the author has discovered a photograph in Péquart & Le Rouzic’s 1927 Corpus des Signes Gravés des Monuments Mégalithiques du Morbihan, which is reproduced here. The feet are quite similar in appearance, albeit slightly smaller at 230mm (ours are about 450mm long). Plate 77 from Péquart & Le Rouzic 1927, showing the twin feet motif on stone 8 at Dolmen du Petit-Mont. This is not the only surprise at Boscawen-ûn. The data has revealed about 500mm above the feet a pair of circular features, also in low relief, which appear very similar to carvings interpreted as breasts on some allée-couvertes in Brittany (Tressé, Prajou-Menhir, etc). Along with the presence of the possible cromlêh noted by Dr Borlase, perhaps we could consider that the stone circle was, for reasons unknown, constructed with reused stone from a much larger chambered tomb which incorporated decorated stones in the Breton style. Those symbols may have had potent significance, enough to position them in the centre of a new monument. Reuse of decorated and standing stones is known in Brittany (see Scarre 2011, p147). Many of the inner faces of the stones at Boscawen-ûn are flat – perhaps once lining a small passage or chamber. More research is in progress and a more detailed article is in preparation. Barbara Bender with Robert Caillaud. The Archaeology of Brittany, Normandy and the Channel Islands: An introduction and Guide. London: Faber and Faber, 1986. Peter Herring. Boscawen, St Buryan, Cornwall: archaeological assessment. Truro: Cornwall County Council, 2000. Martha et Saint-Just Péquart & Zacharie Le Rouzic. Corpus des Signes Gravés des Monuments Mégalithiques du Morbihan. Paris A. Picard & Berger-Levrault, 1927. Chris Scarre. Landscapes of Neolithic Brittany. OUP. 2011. One point – isn’t it the case that many stones in circles have dressed inside faces only, Stonehenge, etc. Also the Hurlers that were probably dressed in situ as, I believe, the fragments were discovered? Thanks so much for this work.